If you’re a regular reader of this blog, you know I’m a card-carrying revision geek. My book for teachers, REAL REVISION: AUTHORS’ STRATEGIES TO SHARE WITH STUDENT WRITERS, features interviews with more than forty authors about how they revise. From time to time, I also like to feature blog interviews on the topic of real revision…the nitty gritty, make-the-book-better strategies that some of my favorite authors use when they’re revising a project. Today, Ammi-Joan Paquette is here to talk picture book revision with a focus on her brand new book. PETEY AND PRU AND THE HULLABALOO! Kate: First of all, congratulations on the new book! Tell us a little about PETEY AND PRU – where the idea started and how the text has changed from its first draft to the published book as you revised. Ammi-Joan: Thanks, Kate! The original inspiration for PETEY AND PRU AND THE HULLABALOO was drawn from my lifelong love of words. I’ve always been the type of person who keeps an “awesome words” page in my notebook/file on my computer. Then one day, a listserv I belong to started swapping and sharing their favorite words—so many of these were ones I loved, too. And seeing them stream by one after the other got me thinking, “What if I could put together these words that are so fabulous to say aloud, so they could form a story?” The idea grew from there. My original manuscript consisted of just those words I had chosen, strung together in story order, but with the bulk of the work being carried by my italicized art notes in the margin. My editor loved the book idea, but wasn’t sure the words-only approach was the best. With his encouragement, I built an actual narrative story around the words, which I am now so much happier with. Kate: So what was your biggest challenge in revising this book? Ammi-Joan: This book was a challenge in that its whole concept was to build a story around words for which kids don’t know the meanings. Put like that, it does seem a bit counterintuitive! But what I tried to do, first in the writing and later in the revising, was to make the story context self-evident enough that the words could be learned just from the story reading. (And, of course, once the story was illustrated by the luminous Joy Ang, the pictures carry a huge part of that load as well.) There is, of course, a glossary in the book—but I really believe that the best way to learn new words is by seeing them in action. And that’s what I tried to do here. Kate: I think picture books can be tough to revise because they’re so concise. Like me, you write for a wide range of ages. How do you find revising a picture book is different from revising a novel? Ammi-Joan: With a novel, I think the hardest part of revision is often harnessing the willpower. It’s making yourself sit down and put those words on paper. It’s all about sheer hard work and time and effort. With picture books, the process is more delicate. There is so little space, and so much that has to be taken into account—story arc, character growth, subtext, rhythm, wordfeel, and more. With picture books, the bulk of the work is done in the pre-writing, so I find I need long stretches of just letting the ideas simmer, trying on different solutions, brainstorming, sticking with it. It’s more of a mental than physical process, of putting yourself in the place where lightning will strike and that perfect idea will float right down on your page, the one that will bring your story together just right. Kate: Will you share a favorite revision strategy when it comes to picture books? Ammi-Joan: Free-writing and brainstorming is a strategy I find really helpful when I’m stuck on a PB revision. I’ll open a document and start talking to myself about what I need to do in this new draft. I’ll make lists whenever I can, write out the problem in different ways, try out crazy ideas that I don’t even think will work. Because it’s a mental/creative/imagination block often, more than a physical one, anything I can do to stir up my ideas and get the juices flowing helps toward the end result. Kate: Thanks for joining us to talk revision today! I support independent bookstores. 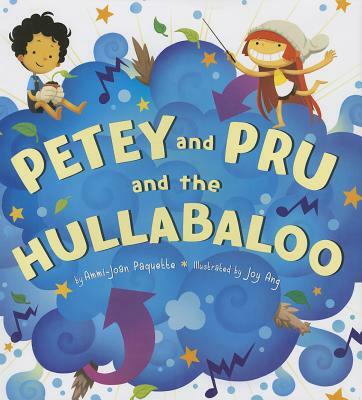 If PETEY AND PRU AND THE HULLABALOO is on your must-read or holiday shopping list (and it really should be!) please consider asking for it at your local indie, or check out IndieBound to find a store near you.